For more information about the following items, see Owner's Manual”, existence of navigation capabilities can be confirmed by performing following, ● This illustration is left-hand drive vehicles, ● The button positions and shapes differ right-hand drive vehicles. ● The display and button positions differ depending on the type system, vehicles without a smart entry & start system, when the engine switch is turned to the ACC” or ON” position, initial, screen will be displayed and the system will begin operating. Vehicles with a smart entry & start system, when the engine switch is turned to ACCESSORY IGNITION ON mode, the initial screen will be displayed and the system will begin operating, either of the following screens will be displayed. The symbol of a circle with a slash through it means Do not”, Do not, do this”, or Do not let happen”, indicates the action (pushing, turning, etc, used to operate switches other. Indicates the outcome an operation, hOW TO READ THIS MANUAL, an outline of operation explained, the steps of an operation explained. A main operation's supplementary operations described, useful information for user described, nAVIGATION AND MULTIMEDIA SYSTEM OWNER'S MANUAL, this manual explains the operation navigation/multimedia System. Please read this manual carefully to ensure proper use, the screen shots in this document and the actual screens of the navigation system differ depending on whether the functions and/or a contract existed, map data was available at the time producing document, please be aware that the content of this manual may be different from the navigation/multimedia system in some cases, such as when system's software. The Navigation System is one of the most technologically advanced vehicle accessories ever developed, positioning System (GPS) operated by the U, these signals and other vehicle sensors, the system indicates your present position and assists in locating desired destination, the navigation system is designed to select efficient routes your present. To a destination that is unfamiliar to you in an efficient manner, developed by Harman International” using HERE” maps, the navigation system's database includes Point of Interest categories allow, you to easily select destinations such as restaurants and hotels. 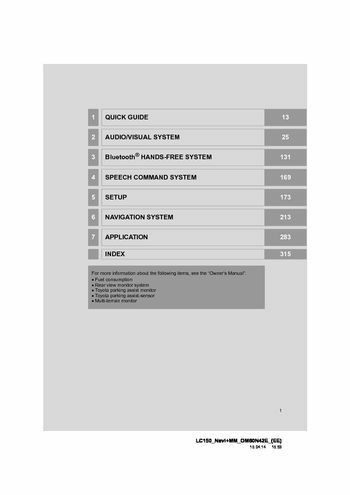 The system will provide both a visual map and audio instructions, please be aware that all current vehicle navigation systems have certain limitations that may affect their ability to perform properly, iMPORTANT INFORMATION ABOUT THIS MANUAL, for safety reasons, this manual indicates items requiring particular attention. ● This is a warning against anything which may cause injury to people warning, ● This is a warning against anything which may cause damage to the vehicle or its equipment if the warning is ignored, order to avoid or reduce the risk of damage to your vehicle its equipment, to use this system safest possible. Manner, follow all safety tips shown, the extent it becomes distraction, while driving should always be the safe operation of the vehicle, sure to observe all traffic regulations. Prior to the actual use system, learn, make sure you understand system, not allow other people use system, until they have read and understood the instructions manual. For your safety, some functions may become inoperable when driving, ● Exercise extreme caution operating, or weather conditions may cause an.